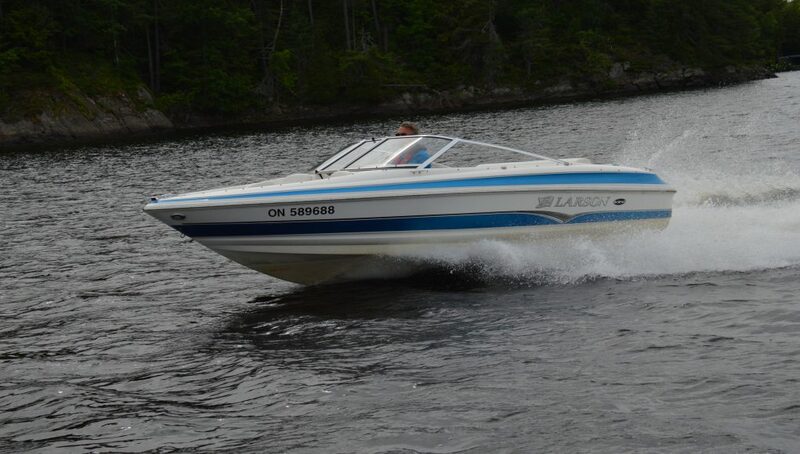 The bowrider is a popular boat style on the used market and one with plenty of manufacturers and models to choose from. A brand you may want to consider is Larson. They have been in business since the days of wooden runabouts and know a thing or two about boats and boater’s needs. The layout of the 180 is classic for the style of boat. There are no truly unique features, but the details are well executed and more than satisfactory for 2007. Two adults can fit comfortably in the bow’s lounge style seats with fixed back and gunwale cushions, complete with storage underneath. Larson’s VEC moulding process means the lockers are gel coated – a nice feature in this boat. Solid stainless steel grab handles and two cup holders round out the amenities up front. Moving back into the cockpit, which is well protected by the curved sport windshield, the layout features dual helm consoles and twin bucket seats – both are bolstered and fully adjustable. The helm sports a very legible and complete set of instruments in the upper binnacle with minimal system switches, while the passenger console is one large, locking storage bin. The Jensen marine stereo is protected from water and sounds great at eight years old. One criticism is the in floor locker. The hatch doesn’t clear the seats, but for a 17-and-a-half-foot boat, the cockpit is roomy, aided by the simple aft bench seat with full beam-to-beam storage. Lifting the small sun pad reveals the MerCruiser inline four, with more than ample space for servicing the engine and associated systems. 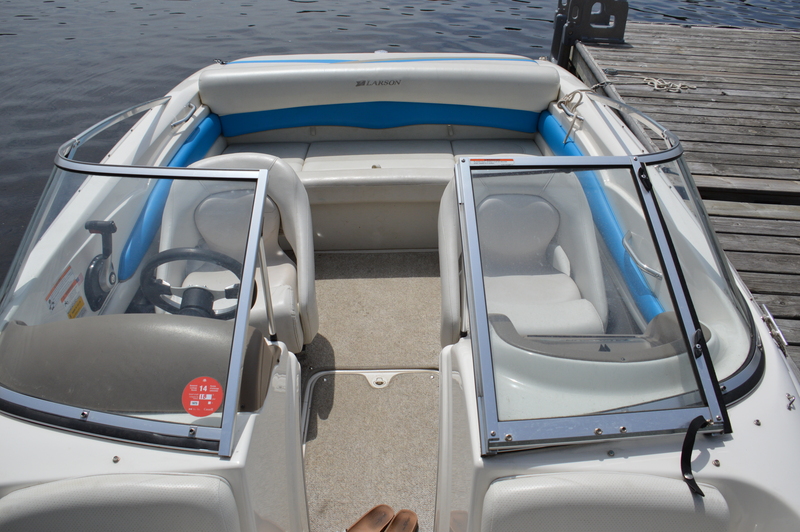 At the transom, the moulded swim platform is small, but functional with a boarding ladder and grab handle. 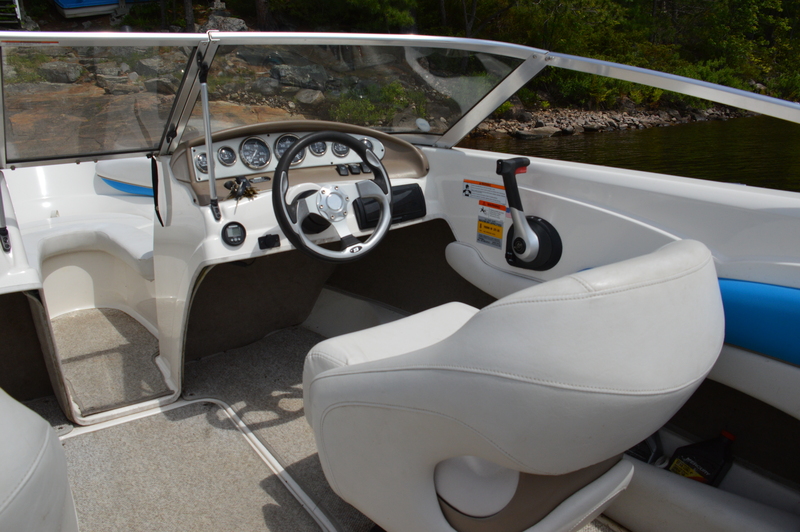 Because of the quality two-tone gel coat, and top grade marine upholstery and carpets, this 2007 Larson has held up well. It just requires a thorough detailing and it would be ready to sell. 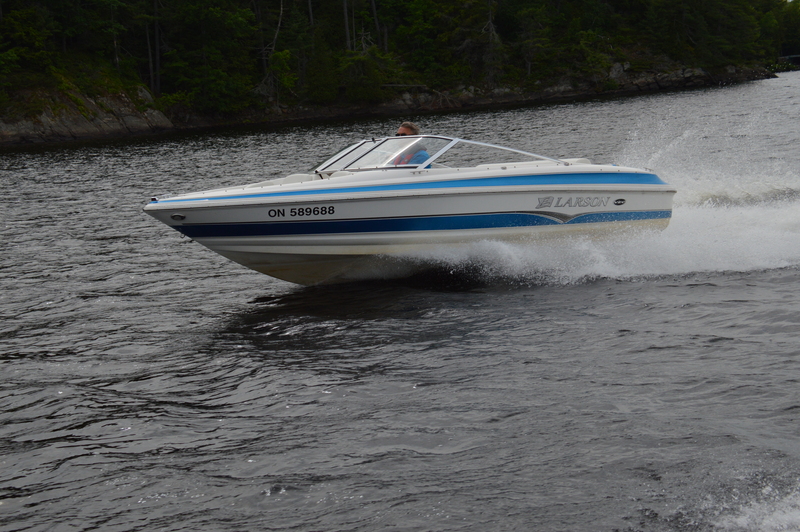 The 180 is powered by a MerCruiser 3.0 litre, four-cylinder TKS (Turn Key Start), sterndrive with an Alpha One drive. Fuel economy and reliability are two great features of this engine. It may not be the fastest, or smoothest, but it works well. The 3.0 L with its two-barrel carburetor produces 135 hp and was capable of propelling the lightly loaded 180 to 20 miles per hour in 7.56 seconds and to 30 mph in 10.8 – modest, but sufficient. The Larson’s Delta VEC hull with 21 degrees of dead rise at the transom provides a dry, comfortable ride. The 180 tracks well and sweeps through turns without any vices. The price for the Larson was great when it first hit the market in ’07. Now a few years down the road, depreciation has certainly improved on that price, making this a good buy on the used market. What you end up with is a family friendly, fuel-efficient 18-foot bowrider, perfect for smaller, cottage country lakes where high speeds aren’t a priority. This boat is featured in the Spring 2016 issue of Boats&Places.